Beveled glass windows are also known as stained glass windows and are popular because of their visual impact. Although, beveled glass does not add to the function of windows, it adds decorative appeal. Beveled glass windows are made with glass cut at an angle less than 90 degrees and when arranged, capture light in an extraordinary way usually forming a prism-like effect because of the varied colors produced. 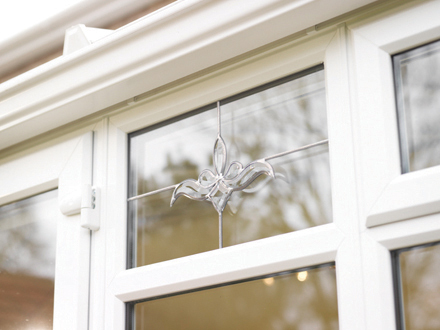 The use of beveled glass in windows and doors became popular in North America during the late 1950s. Beveled glass is usually made of plain glass but to achieve a more decorative window, textured or specialty glass is also used. When opting for beveled glass windows, it is critical to assess the frame as well the arrangement of the beveled glass. Because they are pieces of cut glass placed together, the whole window is practically not whole. A skillful arrangement of the cut glass (without a trace of loose edges or spaces in between) and a sturdy support (carefully measured and installed) are necessary for a durable and longlasting window. Also, determine your purpose or the location that you think would benefit from beveled glass windows. For example, the bathroom windows (even the door) or basement windows can be installed with a beveled glass. Because of the innate opacity of the glass, it may eliminate the need for blinds, plus, it gives the room a spa feel. In other rooms, beveled glass windows may add to your decor, as in a fixed window in your bedroom. The shape of the beveled glass also makes a difference. For smaller areas, choose circular shapes like oval or octagon. Opt for regular shapes like square or rectangle when you need to bring in more light into the room. Because almost all specialty windows are customized, you can request your craftsman or manufacturer to create a design that matches the theme of your house. The usual guide when it comes to purchasing materials involves taking note of cost and quality. The design comes second. There are several windows seller if you search the internet but it will be better if you visit your local stores first. This allows you to experience first hand what you are investing in. You can meet with the manufacturer and personally discuss your ideas as well as the preferred characteristics of your desired window. Discuss with him your purpose and your budget for purchasing beveled glass windows. You may even get a discount. Visit as many stores as you can before you commit to purchasing. Having several options allows you to choose which would be the most practical and logical choice. If you have no idea which manufacturers are credible, you can always ask around the neighborhood. Beaumont Leaded Glass and Restoration is a manufacturer of quality stained glass. They offer lifetime guarantee for maintenance-free products. They offer quality crafted windows since 1987 and they customize beveled glass windows depending on your preferred shape, color and style at affordable prices. Art Windows is another manufacturer known to offer customized stained and beveled windows. They create designs from simple diamond cuts to elaborate floral illustrations. They generally finish the windows in 3 to 6 weeks, assuming the glass and designs have already been chosen. These manufacturers are ofcourse just examples.